I’ve decided I’m going to save up to upgrade my paints from student paints to professional quality paints once I use up what I have. When I finally make the upgrade, I plan to repaint this little guy on a canvas. Feel free to cast your vote in the comments about whether you think he’s creepy or cute. 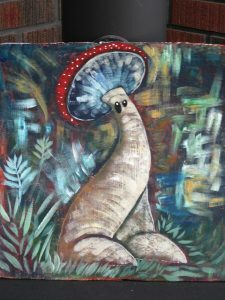 It’s a mushroom with feet and eyes! There’s a large part of me that loves the whimsical and that loves fantasy. This little guy appealed to that part of me and made me think about The Smurfs. If you’d like to know when my next book releases, please sign up for my Mystery Lovers’ Newsletter! 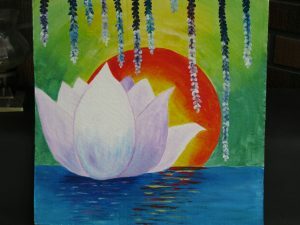 A lotus plant can survive for hundreds of years, and their seeds can still germinate after a long hibernation. They bloom even when the water around them is dark and dirty. They’re a reminder to me of the value of determination and resilience. When things in my life are going wrong, the belief that I can survive them and grow stronger from them helps me stay positive and keep from giving up. We can find beauty even in the darkest times. This week’s painting is another one that I did on a gessoed pizza box. Once I use up the last two box tops, I’m going to stick to canvases or canvas paper. I haven’t liked the smoothness of the surface on the pizza boxes or the way they curve a bit rather than staying flat once they’re covered in gesso. I found the biggest challenge was actually making my paints comply. The color really shifted when it dried so that I had to paint the palm fronds again to get a bright enough green, and I had to add white to my yellow to help it cover rather than being transparent. It barely showed up when I put it on the painting without the white. I also didn’t have all the colors used in the tutorial, but I improvised and I’m happy with how it came out. 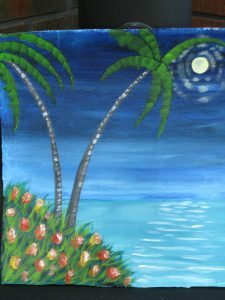 The palm trees were incredibly fun to paint! It’s peaceful. The moon glowing on the water and the flowers surrounding the palm trees made me feel relaxed. Someday my husband and I would like to travel to Hawaii. In one of her videos, I heard Cinnamon Cooney say that being an artist is like being rich because you can paint whatever you’re dreaming about. So this painting is my little bit of Hawaii while we’re saving up to go there. Since I’m a new painter, I’ve started by choosing tutorials that are simple. This one I actually painted on a cut-up pizza box covered in white gesso (you can see the rough edges) because I really wanted to paint, but I have a limited budget for supplies. To my parents, dandelions were weeds. To me, they were beautiful. Few things were more fun than finding a dandelion in seed, taking a huge breath, and blowing the white fluff. 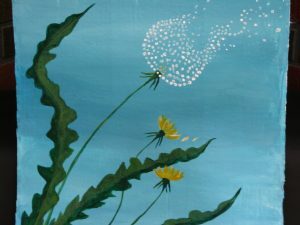 This painting took me back to those carefree childhood days of dandelion necklaces, star spinning, and running through water from the hose.